Last month, Alcatel confirmed that it was working on a Windows 10 smartphone, though it did not provide any official detail about it. Today, we can take a look at what seems to be the brand's first Windows 10-based handset, which is called Alcatel OneTouch Fierce XL. Interestingly, the OneTouch Fierce XL also has an Android version - though perhaps we shouldn't be surprised about this, since it's not the first time when Alcatel is making a phone that can run different OSes. @evleaks revealed images of both the Windows 10-based, and the Android-based Alcatel OneTouch Fierce XL. Naturally, they look similar, save for the capacitive buttons. It's said that the two handsets will be released by T-Mobile USA, though there's no word on exactly when it's going to happen. Specs-wise, the Alcatel OneTouch Fierce XL for Windows 10 and for Android should offer 5.5-inch 720p displays, quad-core Qualcomm Snapdragon 210 processors, LTE connectivity, 2 GB of RAM, and 16 GB of storage space. There will also be two cameras on board: an 8 MP rear one, and a 2 MP front-facing one. 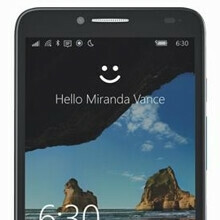 We're expecting both the Windows and Android variants of the Alcatel OneTouch Fierce XL to be pretty cheap. Which version would you buy? Oh yay more budget phablets. It does seem like they are just flooding the market with them lately. 210 is perfectly fine for Continuum yay! Is it weird that when I hear "5.5" I don't even think of the phone as a phablet anymore? Even though hearing "5.7" makes me think phablet... Crazy that a few years ago a 5 inch screen was considered a phablet. Oh how times have changed! I remember when the HTC Evo came out at 4.3" and a friend of mine got one and I was beyond amazed at the size of that phone, but after picking it up and holding it for awhile I decided the phone was much too big for everyday use. Fast forward to today the smallest screen I would use as my daily driver is 5.5". Times have indeed changed! windows is better on budget phones. Android on low specs is crap. Everybody knows it. Ya'll know that running android on a phone with less than 1gb ram it is a nightmare. S210? AAHAHAHAHAHAH. INB4 windows 10 is optimized and similar crap.